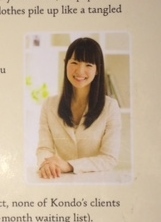 Allow me to introduce you to Marie Kondo, Japanese cleaning consultant, and best-selling author of The Life-Changing Magic of Tidying Up: The Japanese Art of Decluttering and Organizing. She is my new organizing guru, and the real deal. According to Ms. Kondo, once you follow her methods of organizing you will never, ever, ever, ever, ever, ever, have to organize again. The reason? You'll love being organized so much you won't allow yourself to become disorganized again. Marie Kondo has spent her life working on finding an organizing strategy that works for everyone. After years of trial and error she figured it out and wrote it up for the world to follow in her book, The Life-Changing Magic of Tidying Up. Since I started de-cluttering in January I have easily donated or thrown away 50+ bags and boxes of things that are no longer needed from my home. Nearly every weekend my trash cans are full and I make monthly donation trips to Goodwill. I can honestly say that Marie Kondo's methods have changed the way I think about organizing my home; I can find things easier, we don't lose things as often, and it takes less time to pick up the house at the end of the day. If you want to get organized for good pick up a copy of The Life-Changing Magic of Tidying Up: The Japanese Art of Decluttering and Organizing, via the Amazon links here. If you make a purchase through one of the affiliate links on this article you will also help support the MontebelloMom.com webpage at no additional charge to you. 1. Only you can organize your things. The way you want your things arranged only makes sense to you. If you hire a professional organizer to put everything in order for you, you will not be able to keep it up because it's not the way you would have done it yourself. Besides children, whom you can assist, you cannot organize someone else's belongings. It's also not fair to decide for someone else what they do and do not need. Ms. Kondo says if you share a home with others you can only organize yourself, but the others will soon jump in with the organizing process once they see how wonderful you keep your belongings. I didn't buy that concept at all, however after I organized my things on the bookcase Mr. Montebello started organizing his side of the bookshelf! It was truly amazing, especially since I didn't ask him to do it! It was a Marie Kondo miracle! 2. Your home gets messy because the things you keep do not have a home. If a space is always cluttered it's because you have no place for those particular items to be; you place them anywhere, or create a pile of junk for things with no home. Find a permanent place to store homeless items and you will always have a clear corners, countertops, shelves, and tables. My family has a water bottle problem. 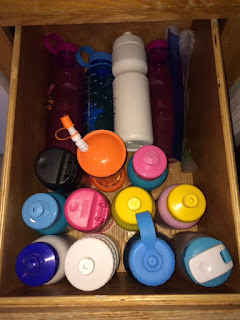 We have well over a dozen water bottles, and only a few match. There are so many I store them wherever there is space, even the windowsill! Yesterday, I got fed up and sat down in front of the two junk drawers in the kitchen with the intent to clear out a whole drawer. I did away with a box of tapered candles, 20 tealight holders from my sister's wedding, butterfly bunting that was only good for getting tangled, and the light bulbs found a new home in the garage with the other fix-it items. I condensed the remaining items into one drawer, leaving the other drawer empty! The water bottles now have a permanent home and I get to keep my sanity. 3. Do not pass along discarded items to another person. If you no longer have a use for an item, but have the mindset that it is too good to throw away or donate, do not pass it off to another family member or friend. You are merely passing the burden of storing the item to another person which is not fair. I have a box near the front door of my home where everyone in my family puts things for donations. I regularly make trips to the Goodwill donation center in Montebello, for additional donation locations click here. For large bundles of trash, call Athens Disposal, (888) 336-6100, during regular business hours to schedule a bulky item pick up. 4. Organize sentimental items last. These items take the longest to organize so it's okay to make save a pile of photos, paperwork, or family heirlooms to go through during the last leg of the organizing. I still haven't gotten to organizing photos yet, but for now whenever I come across a photo I add it to the photograph pile. Ms. Kondo says there is no need to keep dozens of photos from the same event. One picture is enough to remember. 5. You do not need to buy organizing containers. Once you get started organizing you will find you have plenty of boxes or containers in your home already; there is no need to spend money on something you already have. These are boxes from Christmas cards, a cell phone, and sunglasses at the time they were too pretty to throw away, now they have a purpose! My kids use the boxes to hold their colored pencils, and my husband found one to be perfect for holding business cards. I found that the more I organized and purged the more empty boxes I amassed. I now store empty boxes on top of the bookshelf for organizing later. 6. Store items standing up. Standing items on their ends allows for easy visual access and takes up less surface area. If items are stacked in a tall pile it puts undo pressure on the items on the bottom of the stack, and only the items on top are clearly visible. This goes for clothes in drawers, books, makeup cases, everything. I was able to fit a lot more office supply items into a file cabinet we have when I stood up the box of envelopes and the stapler upright instead of lying flat. My husband and I both now fold our shirts smaller and store them in nice rows in the drawers, we can see all the shirts at once rather than riffling through a flat pile. 7. Store similar items together. It makes sense to have all related items stored in the same location. One of the first places I organized was the bookshelves. Looking at the after picture here, the shelves still look pretty messy, but it is a lot better because all my things and the office supplies are on the left, and everything that is my husband's is arranged on the right. He was adamant that I not throw anything away, it's all precious you know! I arranged his side by category, books, movies, cables, and miscellaneous. I used the same method to organize the office supplies. I eventually moved all the office supplies, paper, markers, envelopes, etc. into a newly organized and empty drawer in a file cabinet. No more wasted time searching a dozen different places for needed items, they are all together. If you want to get organized for good, pick up a copy of The Life-Changing Magic of Tidying Up: The Japanese Art of Decluttering and Organizing, via the links here. If you make a purchase through one of the affiliate links on this article you will also help support the MontebelloMom.com webpage at no additional charge to you. Marie Kondo has a second best-selling book Spark Joy: An Illustrated Master Class on the Art of Organizing and Tidying Up. It provides illustrated examples of how to fold clothes, store items, and gives advice for frequently asked questions.